This engaging story tells how a Native American female became a legendary Crow chief. Born in 1800, Pine Leaf longed to be a hunter who rode with the tribe's males instead of learning how to be a lodge woman. The stubborn child proved that she could ride, hunt and fight with the best and fulfilled her dreams of leading warriors into battle in the land later called Montana and Wyoming. In the late 1700s, Ed Rose earned his facial scars in a bar fight in Kentucky. His travels and search for adventure led him to the plains east of the Rocky Mountains. Rose, a guide, interpreter and trader, hunted and fought alongside the Crow, the Arikara, white trappers, and US Army soldiers. He rode with the Crow hunters who captured the girl who became Woman War Chief. The battle for Texas was fought on many fronts. 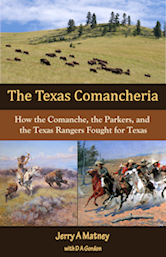 This book centers on the Comanche efforts to maintain their historic way of life, the homesteading adventures of the Parkers, and the Texas Rangers mandate to protect settlers from raids. In 1836 Comanche captured a white girl from the Parker fort; later her son, Quanah Parker, was one of the last Comanche to surrender at Fort Sill. Running Eagle was born near the Rocky Mountains in the late 1700s. With her tribe (Piegan) she hunted for food and fought enemy tribes and was praised for her bravery. Running Eagle often stole horses from other tribes; she is remembered for her vision quest to a waterfall that has been named for her. The book explores Blackfoot traditions along with the threat from encroaching fur trappers. This entertaining memoir contains a hundred stories about the Matney boys, four brothers who found creative ways to have fun in the land around Big Sandy Creek. From the 1930s to the 1950s, these boys and their friends often skirted both danger and the law. Short stories range from intimate to frightening to hilarious as the boys learn to live alongside cows and dogs while constantly trying to outdo one another. This is the story of a young man named Shanghai Sequoyah Pierce, who was born and raised in Texas. He was named for several famous ancestors. Shanghai excelled in sports; he also grew to 6'9" in height. Before attending medical school with his childhood sweetheart he joined the Marine Corps and fought in Korea. Years later he became a veterinarian and married his first and only love.